Delicious and gluten free chicken and beef dishes! From California to Massachusetts, and in many states in between, hungry mall goers can enjoy fresh, fast and tasty Chinese food at P. F. Chang’s. Besides loving any version of spicy chicken and broccoli, I’ve always appreciated P.F. 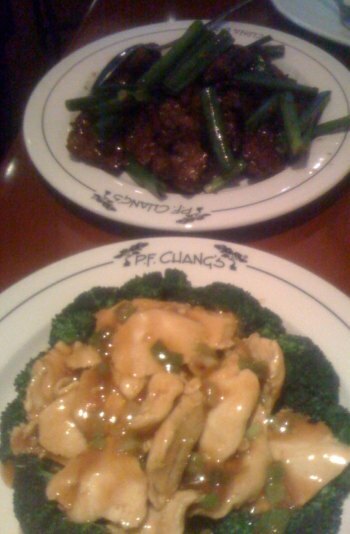 Chang’s diet friendliness. Sure, the portions are huge, but they’re great about providing to go boxes, you can order brown rice, and all of their nutritional information is posted online. Now they’ve added another ingredient-friendly element to their offering: a gluten free menu! Although I’m only an occasional gluten-free eater, I’m always on the lookout for menus that accommodate food allergies or restrictions. When P.F. Chang’s offered me a gift card to try a few items on the new menu, I was delighted to accept. 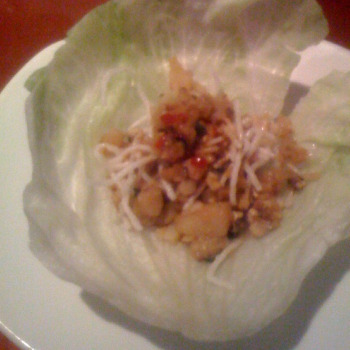 Okay, it was partly because I really like the lettuce cups. But also because I’m a picky eater! On Sunday afternoon, my husband and I took a drive out to the ‘burbs, going north to the P.F. Chang’s in Corte Madera, CA. There was a decent sized crowd in the restaurant, considering it was between lunch and dinner rush. There was a good mix of patrons — families, three lady friends celebrating a birthday, and several couples like us, grabbing a late weekend lunch. As we walked up to the door, my husband whispered, “Prepare to get overwhelming service!” He was right, and it was sort of a joy. Coming from the City, where service can often be disdainful, it was a breath of fresh air to have waters on the table without us asking, and ice tea refills before I got to the slurping stage. We were seated immediately with menus, and started looking for the gluten-free items, to no avail. The signature PF Chang's Lettuce Cups app is on their GF menu! “Excuse me, I thought you had a gluten free menu?” I asked the appropriately attentive waiter (who had no idea I was reviewing the place, I didn’t call ahead or anything) who hurried over when he saw me turn the menu over three times hunting for something that said “gluten free”. “It’s a separate menu, let me get that for you,” he replied. He brought back two, just in case my husband needed one, too. And then, unprompted, he brought me some special gluten free soy sauce, and mixed up a special gluten free bowl of their signature spicy dipping sauce. God, I love their good service! Perfectly steamed broccoli — too often its microwave rubbery, or falling apart from a steam tray. This was bright green, firm and so healthy! 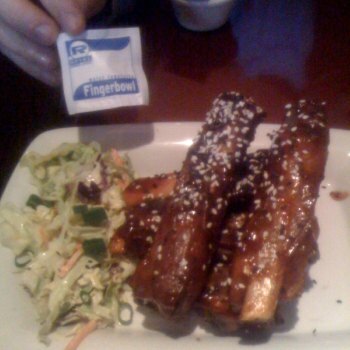 Ribs, with wet wipe included. Not GF, but still delish! Verdict: Delicious! Everything was made to order, so it arrived fresh and piping hot. We wouldn’t have even noticed that the items were from a special menu if we hadn’t specifically ordered them. Even the GF dipping sauce tasted as good as the “regular” one, which I tried in the interest of scientific/restaurant review inquiry, and then made my husband try, for a truly exacting opinion. He agreed. We had so many left overs that we skipped the GF flourless chocolate dome dessert. Since I hate to shirk, I’ll be going back to try it at a later date so I can tell everyone how delicious it is. What can I say, it’s my job to do these nice things for other people, and I owe you that dessert-trying! This entry was posted on Thursday, April 8th, 2010 at 2:13 pm	and is filed under Chinese restaurant, Restaurants and Dining, United States Of America, gluten-free, mall, p.f. chang's. You can follow any responses to this entry through the RSS 2.0 feed. Both comments and pings are currently closed.